BOSTON — From Eddie Shore to Bobby Orr to Raymond Bourque, the Boston Bruins have played a certain way — and been pretty successful at it. The bruising and often belligerent style of the Original Six franchise was best embodied by the “Big Bad Bruins” of the 1960s and ‘70s, and it helped establish the way Boston teams are still expected to play. So when the Bruins lost 6-5 — 11 goals! — to Chicago in Game 4 of the Stanley Cup finals on Wednesday night, purists were aghast. Brent Seabrook scored 9:51 into overtime to help the Blackhawks tie the best-of-seven series at two games apiece and regain the home-ice advantage. 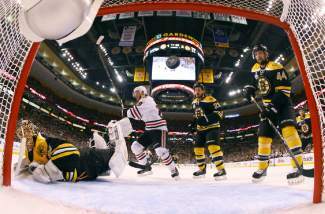 Game 5 is Saturday night in Chicago before the teams return to Boston for Game 6 on Monday. Although it was the third overtime game of the finals, it looked nothing like the tightly contested and low-scoring first three games. The five second-period goals on Wednesday night were as many as the teams scored in Games 2 and 3 combined, and the 11 goals total were nearly as many as had been scored in the whole series to that point. One of the things that opened the game up was Chicago’s early scoring. After going more than 120 minutes without getting a puck past Bruins goalie Tuukka Rask, the Blackhawks made it 1-0 on a short-handed goal in the first seven minutes of Game 4. Then, with the score tied after one period, Chicago took a two-goal lead — its first of the series — with a pair of goals about two minutes apart. In all, the Blackhawks led 1-0, 3-1, 4-2 and 5-4 before taking the only lead they couldn’t give back, winning 6-5 in overtime. Blackhawks coach Joel Quenneville agreed that trading end-to-end rushes isn’t a path to success in the NHL, especially in the Stanley Cup finals. But sometimes the games develop that way. “I think there’s been stretches in all the games where it’s probably been a little bit more free-flowing than others,” Quenneville said. “(Wednesday) night’s game started off like it was kind of not a lot of room, but I think once the puck started going in it seemed like it was end-to-end.